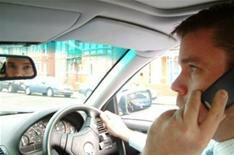 Drivers told 'get off the phone' | What Car? The public want tougher action to target drivers who use their phones while behind the wheel, a new survey has revealed. Drivers who break the law by talking on their phones are the biggest menace on the UK's roads, according to a poll for the Association of British Insurers' (ABI). Those taking the survey also backed insurers taking tougher action to expose motorists who conceal motoring offences, such as speeding and using a mobile phone while driving, in order to get cheaper insurance. • Nearly three-quarters (72%) of people think that drivers using mobile phones are most likely to cause an accident, followed by young male drivers (45%), and uninsured drivers (34%). • Motorists back insurers taking tougher action to expose motorists who lie about or conceal information when taking out insurance 72% would like insurers to be able to check driving licences for relevant motoring convictions or endorsements. Nick Starling, the ABI's director of general insurance and health, said: 'Honest motorists are fed up with drivers who lie and cheat to try to obtain cheaper insurance. 'We rely on people being honest, but those who conceal motoring offences not only push up the cost of insurance for everyone, but also run the risk of having claims rejected. • The main worry for women is the risk of being involved in a staged accident, with a third citing it as their main concern. Male motorists worry most about having their car vandalised (30%). • 30% of motorists think that they are most at risk of suffering a serious injury while on the road, while 15% of women are worried about being injured as a passenger, compared with 7% of men. • The cost of driving annoys 60% motorists the most, followed by traffic congestion (44%), and the condition of roads (41%).